For those who have always wanted to head off into the African bush or rainforest to spot lions, buffalos and elephants, then Nigeria's national parks can more than oblige. 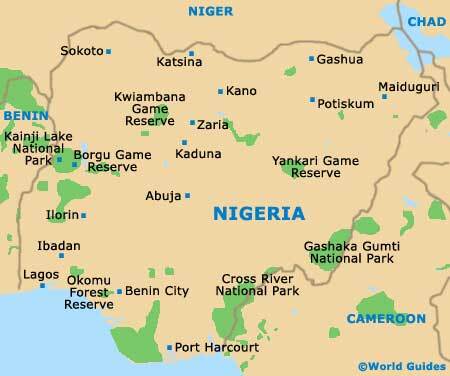 Nigeria has seven national parks in total (Chad Basin, Cross River, Gashaka Gumti, Kainji Lake, Kamuku, Old Oyo and Yankari), with the park at Yankari often regarded as the best of the bunch. The Okomu Forest Reserve is yet another noteworthy safari highlight. If you are planning to enjoy a few days on safari, it is worth timing your visit carefully, as wildlife viewing is much easier between November and April. Wildlife watching in the rainforests of Okomu throws up all sorts of opportunities. In particular, it gives visitors a chance to spot one of the world's rarest primates, the white-throated monkey. Okomu is the last surviving rainforest area in the south-west of Nigeria, making conservation in this part of the country more important than ever. As well as looking out for the resident primates, visitors can enjoy a host of other attractions, from sport fishing to canoeing and crocodile viewing. The Okomu Forest Reserve is fairly well endowed with visitor facilities, including overnight accommodation. The park at Jos, often also called the Jesse Aruku Wildlife Park, is relatively small, covering just 8 square kilometres / 3 square miles of land. Nevertheless, its wooded hills and forest streams make it an ideal place to spot many different sorts of animals and birds, including pigmy hippos, lions and buffalos. The well-kept facilities at the Jos Wildlife Park include picnic spots, a children's playground, a small museum and restaurant. Yankari first opened its gates to the public in 1962, but it wasn't until the early 1990s that it officially became a national park. Over the years, the park has become one of the most popular in Nigeria, attracting thousands of annual visitors. The landscape includes woodland, rolling hills and savannah grassland. Animals that can be spotted include elephants, olive baboons, hippos, waterbuck, hartebeest and lions. 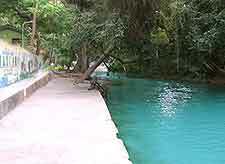 Over 300 bird species also make Yankari their home, while the four thermal springs are an added visitor attraction. Facilities include Wikki Camp, a small museum and restaurant. The main entry point is in the village of Mainamaji, near Dindima. The Cross River National Park is widely regarded as one of the richest areas of rainforest in the whole of West Africa. Created with the help of the World Wide Fund for Nature, the park is divided into two sections - the Oban Hills Division and the Okwangwo Division. 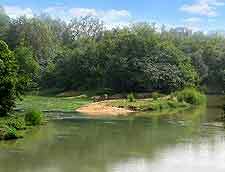 The Cross River is known for its numerous species of plants and birds, and is also home to over three-quarters of the primate species that can be found in Nigeria. These include western gorillas and chimpanzees. Other wild animals found in the park include African forest elephants, which are currently on the endangered animal list. Created after the combining of two existing reserves in the early 1990s, the Gashaka Gumti National Park currently ranks as the country's biggest, covering a vast area of just over 6,400 square kilometres / 2,470 square miles. The southerly region comprises a particularly rugged and undulating terrain, being where you will find the Chappal Waddi - the tallest mountain in the whole of Nigeria, measuring in at around 2,419 metres / 7,936 feet in height. Even during the West African dry season, the Gashaka Gumti sees a decent river flow, supporting an assortment of wildlife and some extremely colourful birds, such as red-faced lovebirds. Located on the north-eastern side of Nigeria, the Chad Basin National Park is spread over a little more than 2,250 square kilometres / 870 square miles and is made up of a number of distinct regions, such as the Bade Nguru Wetlands and the Chingurmi Duguma area. Visitor numbers tend to be fairly low, since the animals here are considered relatively common and therefore rather unappealing to many. The facilities are basic and off-road vehicles are now necessary. Encompassing roughly 1,100 square kilometres / 425 square miles, the Kamuku National Park is home to an archetypal Sudanian Savanna ecology and landscape, with large flat expanses sloping towards the easterly Birnin Gwari Ridge. Many attractions reside here, including the Dogon Ruwa Waterfalls and the Tsaunin Rema hill, as well as the isolated Goron Dutse rocky outcrop, which boasts distinctive black and white patterns. Wildlife is in good supply at the Kamuku, with particular highlights including antelope, baboons, elephants, hartebeest, monkeys and secretary birds. The Kamuku and Gwari people occupy areas of the park and have become known for their fine pottery and weaving. The Kainji Lake National Park can be found some 560 km / 348 miles north of the city of Lagos and fairly near to Nigeria's border with Benin. The park has two sectors, the Borgu Game Reserve and the Kigera Sector, both of which surround Kainji Lake. Kainji is home to a rich variety of wildlife, such as baboons, hippos, hyenas and warthogs. There are plenty of activities to be found within the national park's boundaries, including boat cruises and wilderness treks. Easily accessible and covering approximately 2,500 square kilometres / 965 square miles, the Old Oyo National Park is home to a large number of bushbuck antelope and buffalos, together with countless bird species. Tourism is promoted in the surrounding tourist destinations of Igbeti, Igboho, Iseyin, Saki, Sepeteri and Tede, where many attractions await visitors. In the park itself are granite outcrops, large caves and several prominent rivers (Ogun, Owe, Owu and Tessi). The central area lends itself to mountaineering, while the Ikere Gorge Dam offers popular water-based recreation.